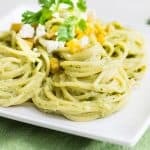 If you’re looking for something different than your typical pasta recipe, look no further than this pasta poblano. 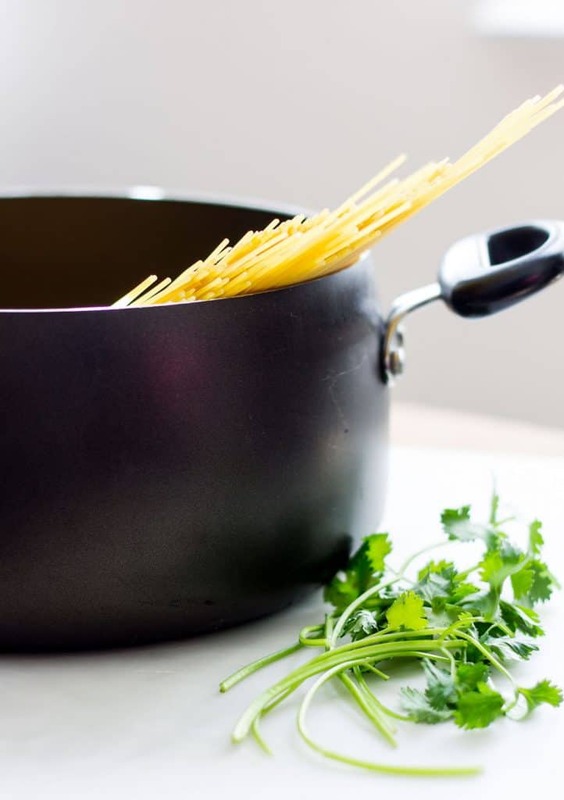 Full of vibrant flavors with all the comfort of any classic pasta dish, this recipe will quickly become a favorite in your meal rotation. Traditional pasta dishes utilize tomatoes for a red sauce pasta, basil for a green sauce, or parmesan and cream for a white sauce. 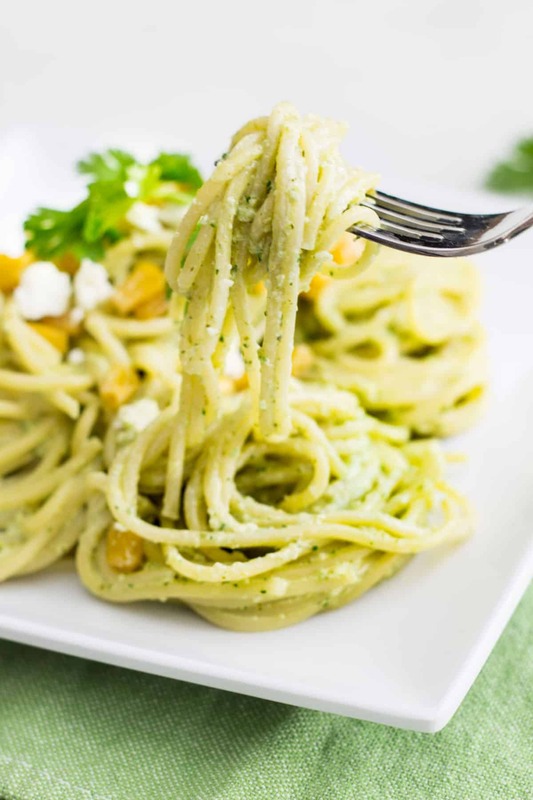 This pasta poblano is completely different. 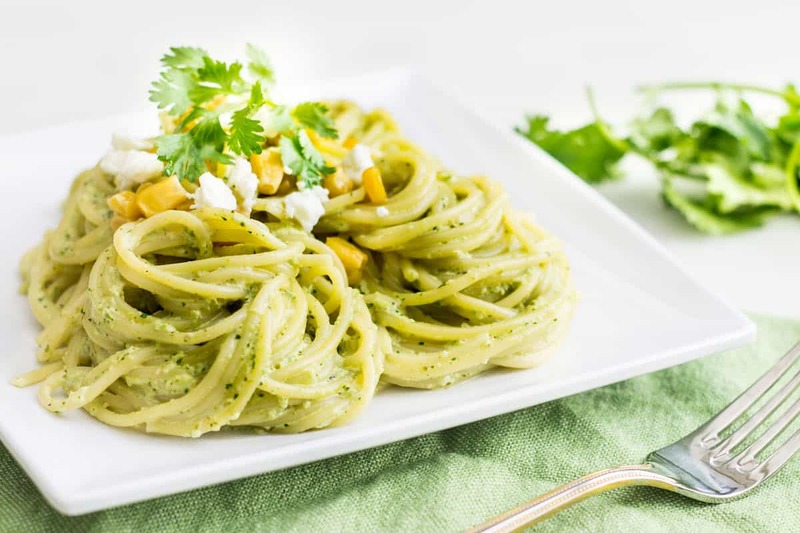 Pasta poblano is a gorgeous fusion of bright and zesty flavors. 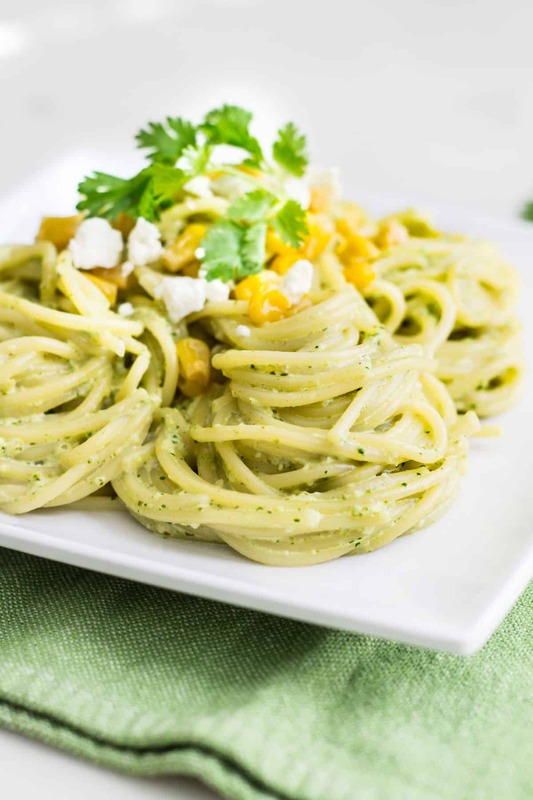 To create the creamy sauce for this dish, I utilized poblano chiles, jalapeño, and cilantro. The chiles and jalapeño give some spice to the dish, but nothing too crazy. It’s just enough to make your tongue slightly tingle. The cream aspect of this dish comes from fresh Mexican crema, a truly delightful substitute to your typical heavy cream. 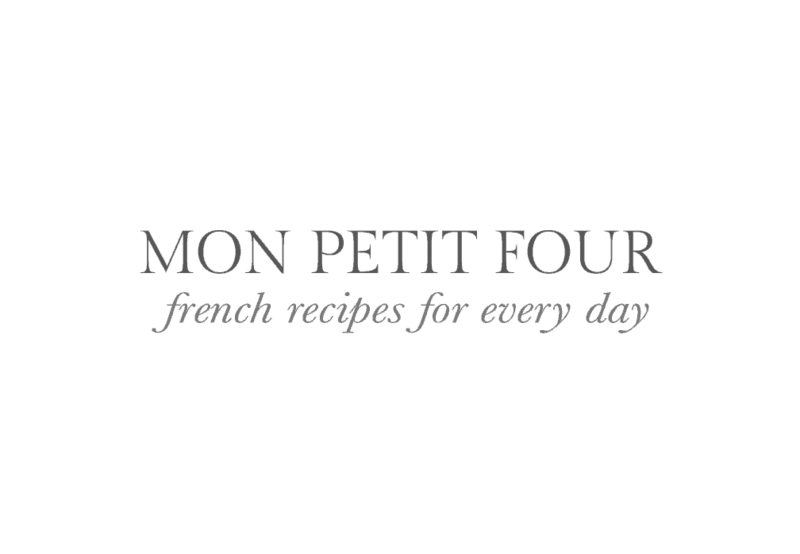 It’s what pulls all the sauce ingredients together into one silky, delicious coating for the pasta. Whenever I’m making any type of pasta, I typically turn to Barilla pasta. 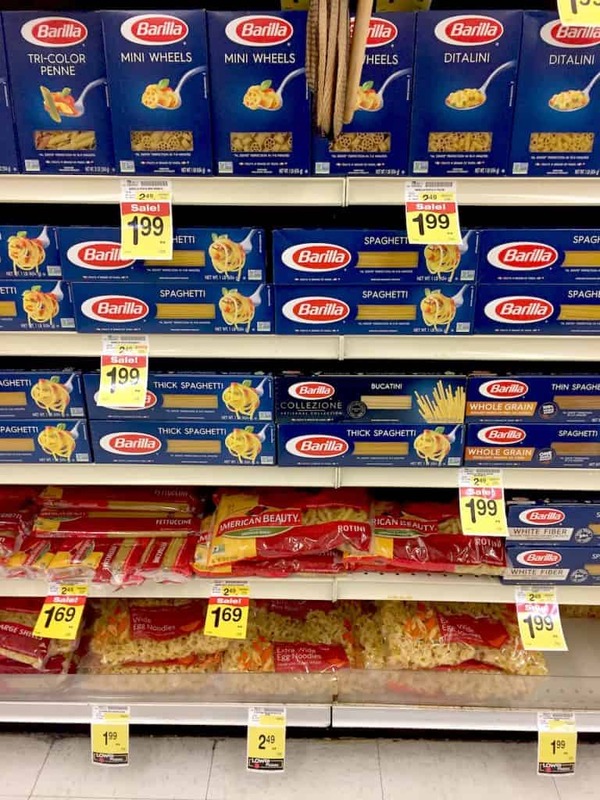 They have a variety of cuts, but spaghetti is normally one of the cuts I stock up on at my local Albertsons (you can save on Barilla pasta with this coupon right now). I also love that Barilla pasta always cooks perfectly when I follow the package instructions. It’s not too firm, but it’s also not mushy; it’s perfectly al dente. 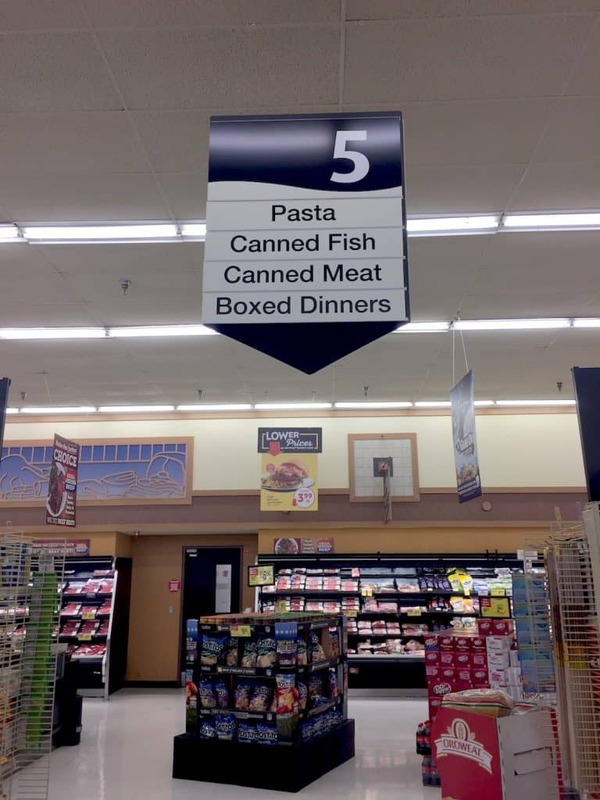 Barilla spaghetti can be found at your local Albertsons in aisle 5. 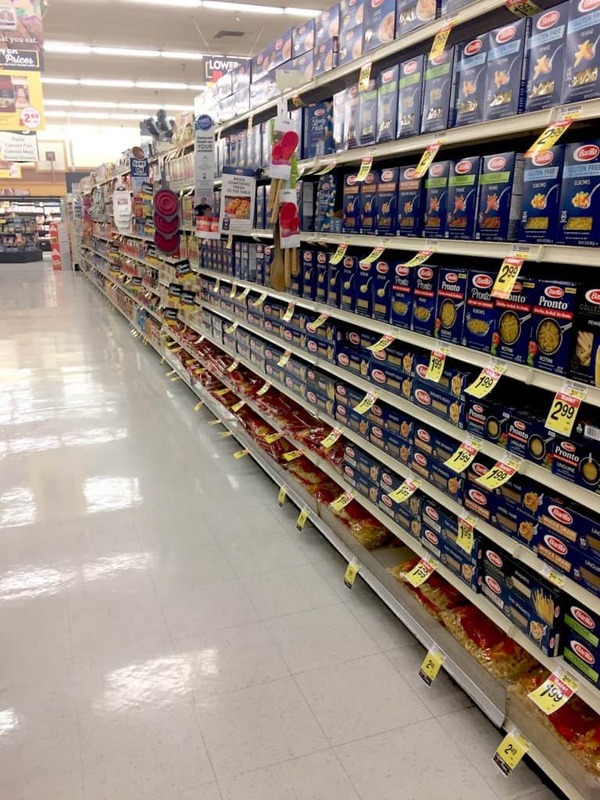 Barilla pasta is usually halfway down through the aisle. 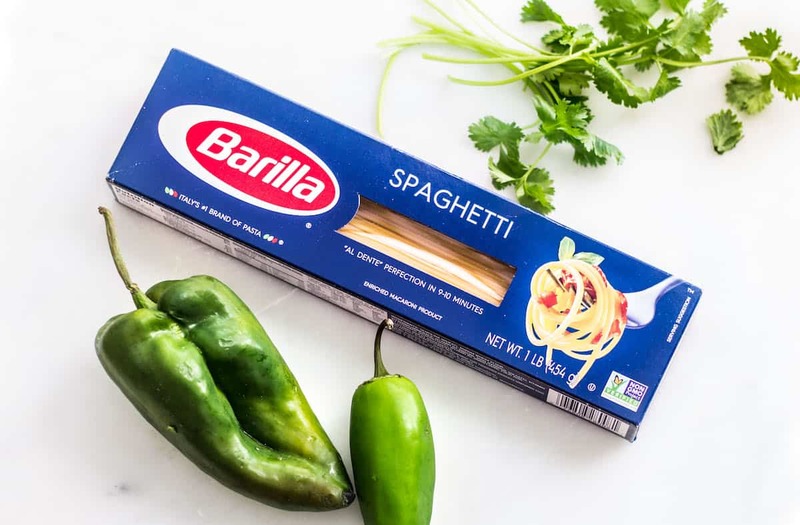 You will find Barilla spaghetti nestled among all the other pasta cuts Barilla creates. I just love the idea of twirling spaghetti around my fork; there’s something very nostalgic about it for me. I also find Barilla pasta to just be a fabulous canvas for all types of flavors, as evidenced here before too. 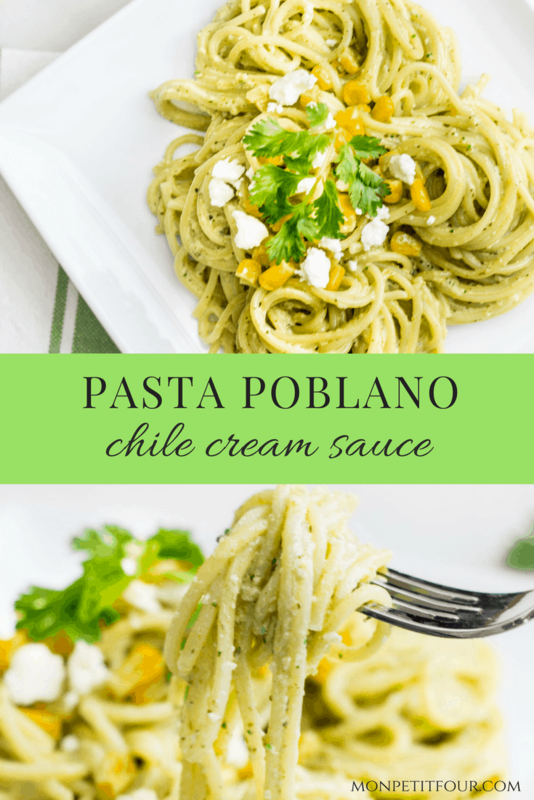 In pasta poblano, the chile cream sauce adheres to the spaghetti in the most delightful way. 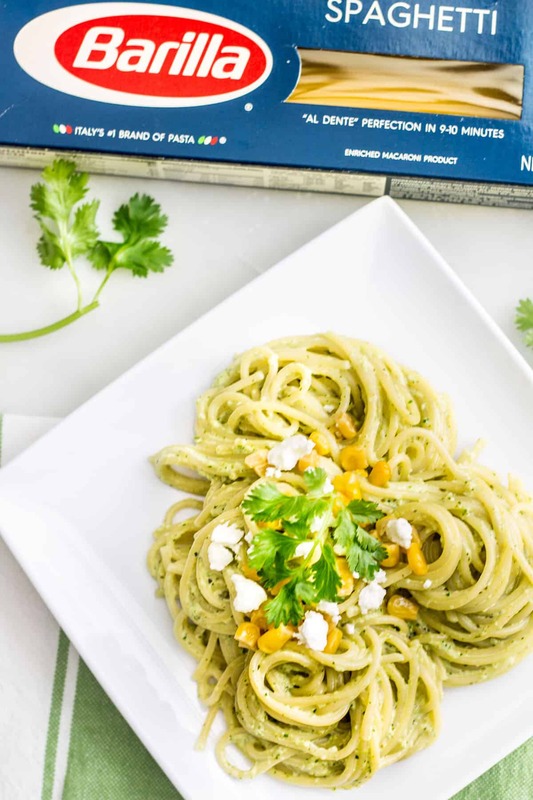 While the creamy aspect really brings the comfort quality to this dish, the bright flavors of poblano chiles, jalapeño, and cilantro make this pasta feel fresh and stimulating. You can create the sauce in a blender. 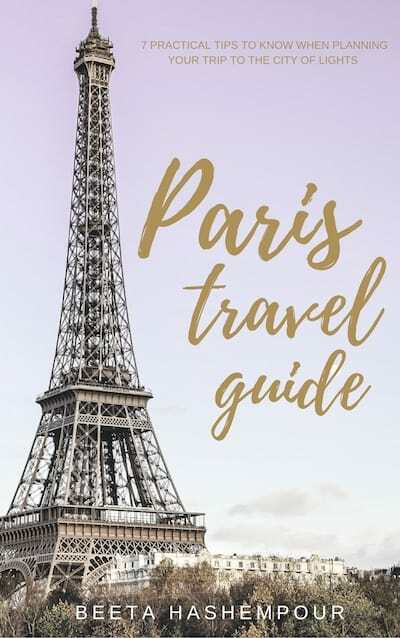 Prior to adding all the ingredients to the blender, however, you simply need to cook the chiles in the oven under the broiler for about 10 minutes, and sauté some onion and garlic as well. These ingredients eventually get added to your blender or food processor, along with some chopped jalapeño, chopped cilantro, and the crema. 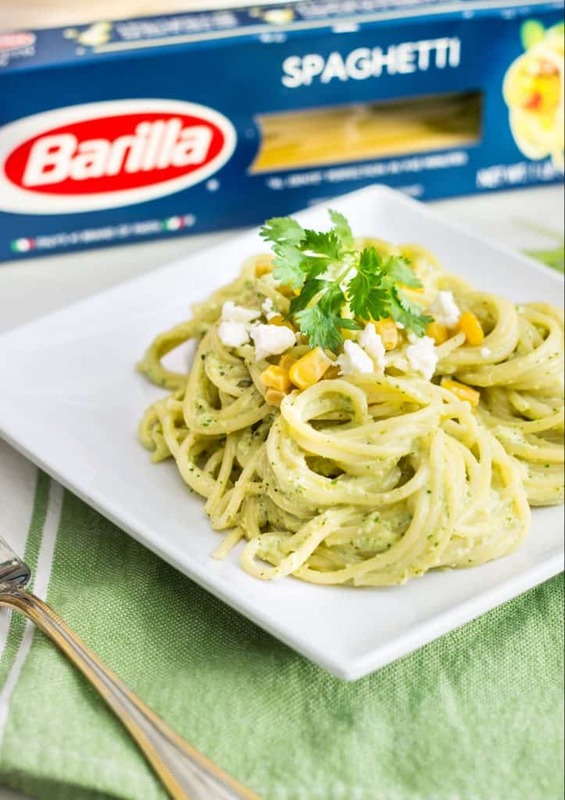 The resulting purée is quickly warmed in your pan and then tossed with the Barilla spaghetti for a quick and easy dinner that you will absolutely love! A vibrant pasta made with a slightly spicy, chile cream sauce. Turn on your oven's broiler, set the poblano chiles onto a foiled lined baking sheet and place under the broiler for approximately 10 minutes, rotating every few minutes, until the chiles are nicely charred all over. Meanwhile, warm up the vegetable oil in a large pan over medium heat. Add the onion and sauté until softened - about 3 to 4 minutes. Add the garlic and sauté for 30 seconds. Remove from the heat. Once the chiles are ready, take them out of the oven and immediately dump them into a large bowl. Cover the bowl with a large plate, or something else that can cover the top of the bowl, and let the chiles steam cook for another 10 minutes. Meanwhile, cook the spaghetti according to the package instructions. Once the chiles are cool enough to handle, peel the skin off the chiles and remove their seeds. Chop up the chiles into small chunks. To the blender, add the onions, garlic, chiles, jalapeño, and cilantro. Pulse until everything is mixed well. Add in the crema, along with a pinch of salt and pepper, and pulse again until the mixture is smooth and thoroughly combined. Taste test and add more salt or pepper, if necessary. Pour the sauce into your pan and cook over medium heat for a minute, just to warm up the sauce. Drain the spaghetti and add into the sauce. Toss to combine and plate immediately. Garnish each serving with some crumbled cheese and a tablespoon of canned corn. The recipe does not tell you when and where to add the poblanos. Hi Mindy! Thanks so much for the kind feedback! 🙂 The best alternative to dairy here that I can think of is cashew cream. It would still have luscious creamy texture like the crema, but less fat. You might need to work on the flavors a bit, but then again, the chiles are quite flavorful so they might just do a good job of masking any nutty taste. Cashew cream is typically made with a cup of raw cashews (soaked overnight), then drained and blended in a food processor with a small pinch of salt and about 1/2 cup to 3/4 cup water (just depending on the consistency you want). This was incredible! I used chile serrano instead of jalapeño for a spicier blend, and loved it!